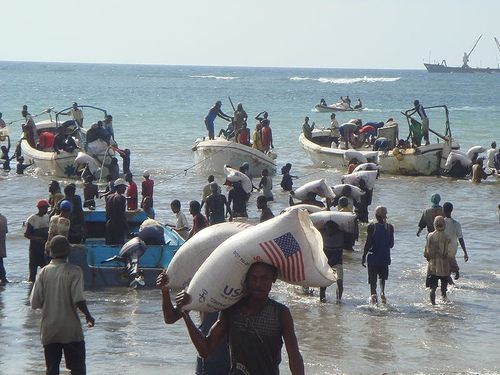 On March 9, citing an unreleased report of the United Nations Monitoring Group on Somalia, the New York Times reported that “as much as half” of World Food Program (WFP) aid to Somalia “is diverted from needy people to a web of corrupt contractors, radical Islamist militants and local United Nations staff members.” Two weeks later, Newsweek called the Monitoring Group report “a damning portrait” of WFP operations and said “an estimated 50 percent of food delivered by the U.N. agency is essentially being stolen.” In last Thursday’s hearing on global hunger, Senator John Kerry referred to these “alarming reports of assistance being diverted into the hands of militants” in Somalia, even as he defended U.S. funding of WFP and other humanitarian programs. It is unclear, however, that the U.N. Monitoring Group report (now publicly available here) fully supports these harsh assessments. The 50% figure is not a calculation but rather an “approximate” number given in conversation by unnamed sources. Anonymous sources provide the basis for all claims of food aid diversion in the report, which “considers as ‘beyond a reasonable doubt’ the information obtained from or volunteered by at least three credible and independent primary sources.” The report’s heavy use of anonymity is understandable for security reasons but makes its conclusions difficult to evaluate, especially in a country characterized by economic and ideological competition between clans. In response to the report, WFP Executive Director Josette Sheeran told reporters, “We have had no evidence and have not been presented with any evidence of any wide-scale diversion at any level anywhere near what was presented based on conversations in that report.” She reiterated this position last Friday, saying that a WFP audit of its Somalia operations last year “found no evidence whatsoever of large-scale diversion of food in Somalia.” While the high-risk environment makes frequent oversight all the more important, it also makes it particularly difficult. Two WFP monitors were killed in Somalia last year. Safety concerns prevented the three person Monitoring Group from leaving the government-controlled capital to explore southern Somalia, the region in which almost all alleged diversions occur. The militant Islamist organization Al Shabab, which controls most of southern Somalia, drove WFP from the region at the beginning of the year—at odds with the contention that militants were profiting from WFP corruption. In late 2009, Al Shabab made 11 demands of WFP, including that it remove female employees from Somalia and that it pay $40,000 annually in protection money. Choosing to preserve its impartiality, the U.N. agency suspended its operations in southern Somalia in January, a decision that not only came at great humanitarian cost in that region but also increased pressure on crowded refugee camps in neighboring Kenya. The potential diversion of World Food Program aid (44% of which in 2009 was paid for by the United States) to Al Shabab, however, carries particular geopolitical significance due to that organization’s ties to Al Qaeda. According to many reports, Al Shabab has “received training from longstanding al Qaida members in East Africa and has pledged support to al Qaida’s agenda.” That connection gives this controversy an easily communicated political narrative—U.S. money catering Al Qaeda—that past episodes of apparent diversion may have lacked. Allegations of diverted aid in the world’s most unstable failed state must be taken seriously. On this point, all parties to the controversy agree. Previous audits by WFP resulted in canceled contracts and improved verification regimes in Somalia. The agency has made clear that it “will cooperate with any independent inquiry” and has organized a meeting in May with Coca-Cola, Walmart, and other private sector experts to discuss best practices in supply chain management. What is needed in response to the Monitoring Group report are continued efforts to investigate its claims, improve monitoring, and further guarantee the delivery of much-needed food in the world’s most difficult regions.